"For a family that LOVES bread pudding, double this recipe and bake it in a 9x13-inch pan. Enjoy this healthier version - which features whole wheat bread, reduced sugar, and apple or pear - for breakfast or dessert! Optional: Dust lightly with confectioners sugar before serving. Yum!" Break bread into small pieces into an 8-inch square baking dish. Mix in raisins and apple. Drizzle with melted butter. Combine eggs, milk, sugar, cinnamon, and vanilla extract in a mixing bowl. Beat until well mixed. Pour over bread and lightly push down with a fork until bread is covered and soaking up egg mixture. Bring a kettle of water to a boil. Place bread pudding baking dish into a large roasting pan. Carefully pour boiling water around pan. Bake in preheated oven until a knife inserted into the middle of pudding comes out mostly clean, about 45 minutes. The ultimate combination of pumpkin pie and bread pudding. 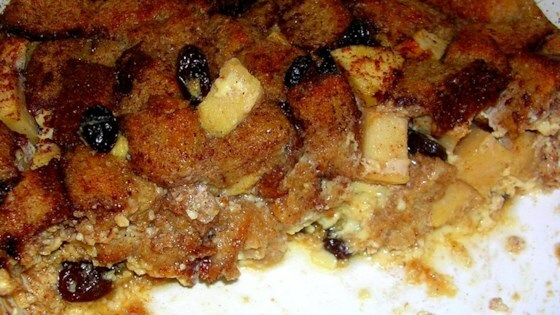 This recipe is a healthier version of Bread Pudding II.